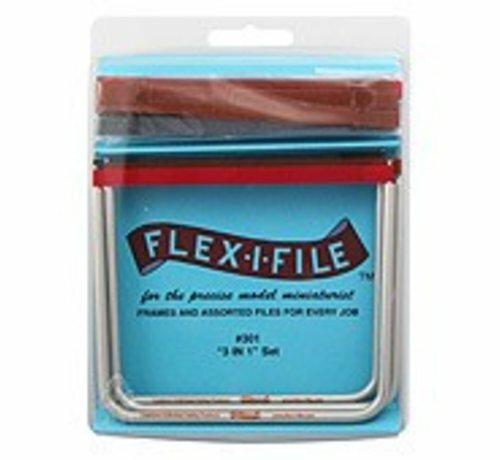 Flex-i-File “3 In 1” Set is a collection of 3 Anodized Aluminum Frames and an assortment of abrasive tapes for the precise model miniaturist. When secured on the lightweight Anodized Aluminum Frame, abrasive tapes will bend and conform to your work surface without breaking. 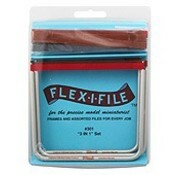 The winning combination of abrasive tapes with the tailored frame tool provides a delicate touch for hairline accuracy. Removes flash from plastic or metal casting, smooth’s, and polishes rough surfaces and seams. 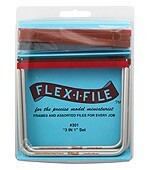 Tough yet flexible the refill abrasive tapes can be used on wet or dry applications.